Dr. Salazar joined Mt. San Rafael Hospital in 2014, and serves as one of our visiting physicians at the Mt. San Rafael Hospital Specialty Clinic. Dr. Salazar completed her undergraduate studies at Colorado College in Colorado Springs. She went on to receive her medical degree at the University of Colorado School of Medicine in Aurora. She completed her residency in otolaryngology–head and neck surgery–at the Baylor College of Medicine in Houston, Texas; where she was also elected Administrative Chief Resident. 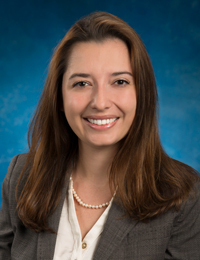 Dr. Salazar is board certified in otolaryngology. Dr. Salazar was born and raised in Alamosa, is a general otolaryngologist, and believes in the importance of providing patient-centered care through empathy and good communication. Dr. Salazar treats the full spectrum of ear nose and throat problems in both children and adults. Her clinical interests include ear disease and dizziness, thyroid and parathyroid disorders, allergic rhinitis, endoscopic sinus surgery, head and neck tumors, and obstructive sleep apnea. Dr. Salazar enjoys running, hiking, cooking, and spending time with her husband Adam.